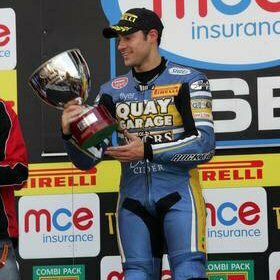 Mason rounded off his 2009 season with a win and two second places in the British Superbike grand finale at Oulton Park. Riding the Q8Oils lubricated Quay Garage Honda, Mason had already won the Mirror.co.uk Cup championship and was hoping to score sufficient points at the Cheshire circuit to secure a top 10 finish in the main MCE Insurance series. Second fastest of the Cup riders in qualifying, Gary started the first race, on Saturday, in 18th place on the Superbike grid. The race was run over 12 laps, having been restarted after a serious crash involving Karl Harris on the third lap. Gary finished first of the Cup riders, in 13th overall, earning valuable Superbike points, followed across the line by fellow Cup racers Peter Hickman of Ultimate Racing and Team NB's Tommy Bridewell. Race Two, held on Sunday, was also incident-packed. Chris Walker took to the grass on the Motorpoint Yamaha, with the safety car called out on lap eight when the Kawasaki of Julien da Costa blew up in spectacular fashion. Tommy Bridewell was first home of the Superbike Cup riders, with Gary Mason right behind, in 12th overall, earning yet more points to his tally. In the final race of the day, and the season, NB Suzuki's Tommy Bridewell took the Superbike Cup win again, despite running across the grass on the first lap and re-joining in last. However, Gary Mason followed him across the line, this time in 10th place, for even more superbike points. With the scores finally counted, Gary Mason won the Superbike Cup with a massive 154.5 point lead. He narrowly missed his goal of a top 10 in the MCE Insurance British Superbike championship, settling for 12th equal with Glen Richards of HM Plant Honda, just six points adrift of tenth place. The lubricants used by Quay Garage Honda are blended in Q8Oils' purpose-built plant in Leeds, just like the Q8Oils range of MOTO SBK oils that are available to road riders. For more information on the Q8Oils range of market leading motorcycle lubricants, please contact: marketing@Q8Oils.com T: 0113 2350555.